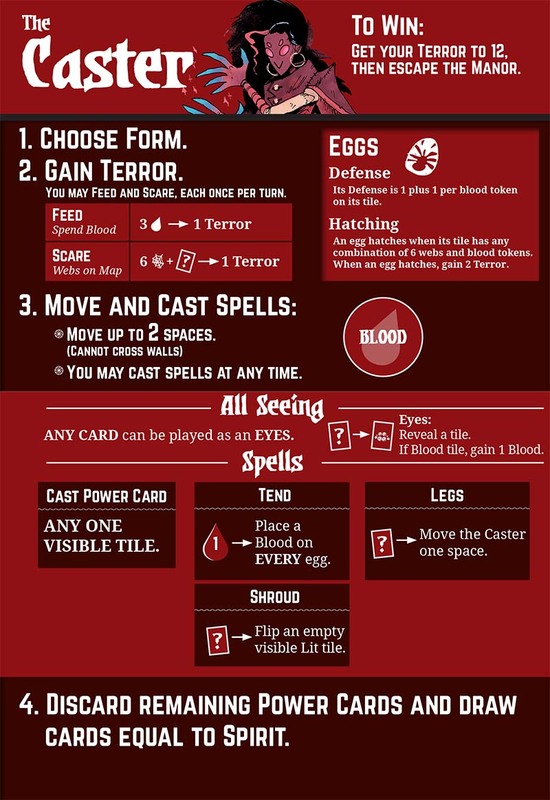 Editors Note: To create truly great board game art I believe you need to marry it with effective graphic design. So far on this site I’ve done a good job of covering the illustrations, but graphic design has thus far been sorely ignored. I’d like to change that and this interview (conducted late last year) is the first of many I’ll be doing to cover this area. If you enjoy the interview below, let me know! With your feedback and guidance I’d love to make this site even better in 2019. Thanks all. Hi Nick, thanks for joining me! For our readers who aren't aware of your work could you tell us a bit about yourself and what you do? Thanks for having me Ross! I'm a graphic designer living in Hopkins (just outside of the Twin Cities) currently working as a graphic designer for Leder Games! Outside of board games I'm also really passionate about art toys and model making. Lately, I've been trying my hand at making molds and casting my own resin figures and have recently developed an obsession with Gundam models. Where did it all begin, how did you work your way into the board game industry? During my education and professional development, I always had in mind I wanted to be involved in tabletop games, but I never really knew what that would entail. I just knew I wanted to be involved in the process. Like many people my friends and I would attempt to make our own games but nothing that made it past the kitchen table. I had a couple interviews at Fantasy Flight Games that didn't go anywhere before I saw a job posting for Leder Games. Patrick and I had a brief back and forth then 2 weeks later he was asking me to start! I was originally brought on with the main purpose of making and updating play-test kits for our upcoming title Vast: The Mysterious Manor, but as the position developed it was obvious that I could be more involved. As of late, an average day for me probably includes a meeting with Patrick or Cole discussing rules and developing ideas, then we break off and I’ll go and make any new game assets or changes that we'll need if we're play testing that day. I also may be coordinating with our foreign language partners to answer questions or creating marketing assets for our Sales Manager, Clay. 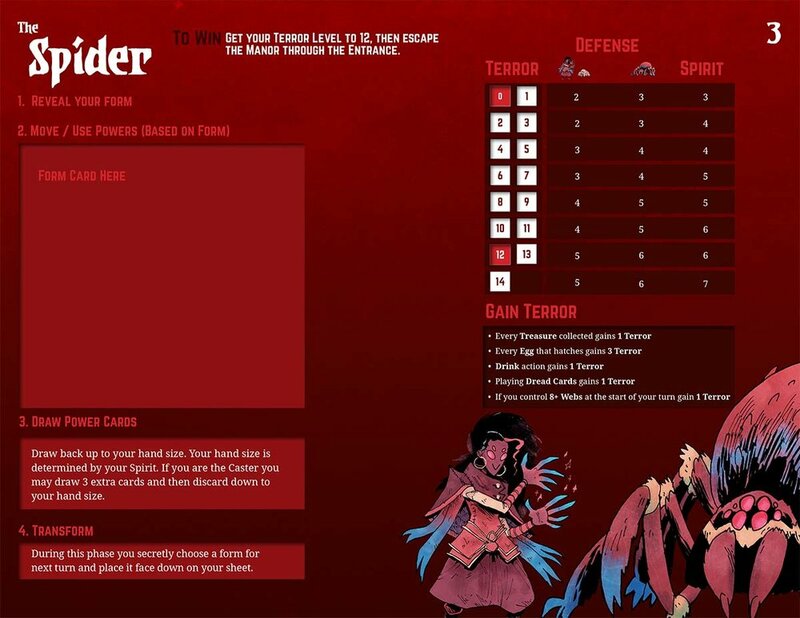 I honestly couldn't have gotten luckier to be so involved in the game creation process - I know most companies don't operate like Leder but I think the process shows in the product. Where was your experience based before joining Leder Games and how did that prepare you for the job? Outside of freelance projects my largest experience doing graphic design was for a department at the University of Minnesota, where I graduated. I think that job was more stereotypical of what people think when they hear "Graphic Designer". Me and the team would plan new initiatives, create assets for fundraising campaigns, and coordinate with printing services. We operated like a marketing team, and in that setting, the amount of information we needed to communicate was often small as well as being simpler. Because of that, solutions were more varied and we were working on new things constantly. My position at Leder Games on the other hand, is a combination of graphic designer and usability developer. I'm working on one game at a time where my focus currently is on clarity of information and mechanics. So when I'm designing components like player boards for example, my attention is on effective and clear communication rather than an amazing visual element (after all that’s why we have Kyle Ferrin). I've actually found working like this to be more similar to the work I did while pursuing my product design minor - it's about focusing the design on the person who's going to be using it. There are still similarities as well - our need to iterate rapidly, and quickly tear down and rebuild ideas (prototypes) feels more similar to my time at the university job. Based on what you’ve learned so far at Leder, what do you think makes for good graphic design? For me, its about successful communication of information. The last thing you want a user to experience is not knowing how to interpret what’s in front of them. To put it simply, board games are complicated and its my job to visually minimize that complexity. Compared to designing for advertising or logos, there's much less opportunity or reason to be "clever" and anyone who has done design stuff knows what I mean when I say "clever". Board game graphic design isn't the place for a logo that has two images hidden in it or an abstract representation for your icon. Board game graphic design is the time to be clear and concise, sometimes this means you don't get to do the "clever" idea and I think that's where a lot of board game graphic design fails. When it comes to being clear and concise, what are some of the most important things you’ve discovered? Tough question, and I mean I'm still very new at this but if I was going to name some of my biggest lessons. If something seems awkward to communicate, it probably is. Explaining something should never feel uncomfortable, if it is, try to express it differently or recognize the rule/mechanic is weak. Physical mechanics, written rules, and thematic components always need to work towards the same purpose and can often inform each other. I.E You can answer a lot of questions about how something should work mechanically by asking why it works thematically and so on. If people keep interpreting something "wrong" they may just be right. Its not always worth fighting against human nature. If people keep interpreting something a particular way, see if you can leverage that expectation. Following on from this how much does play-testing and feedback shape your work? Next to direct feedback from Patrick and Cole, I'd say our play-testers are the people with the largest impact on graphic design changes. I'm actually writing this at a time where our rules editor, Josh Yearsley, is in town, and we're doing what I believe is one of the most important steps in this process. We bring in as many groups as possible who have little to no experience with what we're working on (currently Vast: The Mysterious Manor) and we watch them learn to play the game. Often, it's completely blind - we ask one player to read the rules, then they teach the others, and they all play. We watch, take notes, and try to allow them to learn and figure things out themselves, only helping when necessary. Josh distills all that feedback and we work together to re-organize information to deal with any problems we saw. These are often small changes with huge positive impact, both in language and presentation. Additions of simple things like small arrows, adjusting leading between text, and word choice like "all" vs "every" can remove minutes of rules checking and frustration. And that’s always been one of my biggest personal goals working in the game industry - making games easier to learn and less frustrating for the players. Is there a minimum amount of time you think should be spent on the feedback loop of play-testing and changes? How do you know when you've got to that sweet spot where the game is ready? You should see questions being answered by the other people in the game and their own materials rather than referencing the rule book. You should see people asking each other about their specific rules. You should see people surprised/impressed/jealous of what others can do. You shouldn't have any rules you don't like explaining. You shouldn't see people attempting things just because other players can. 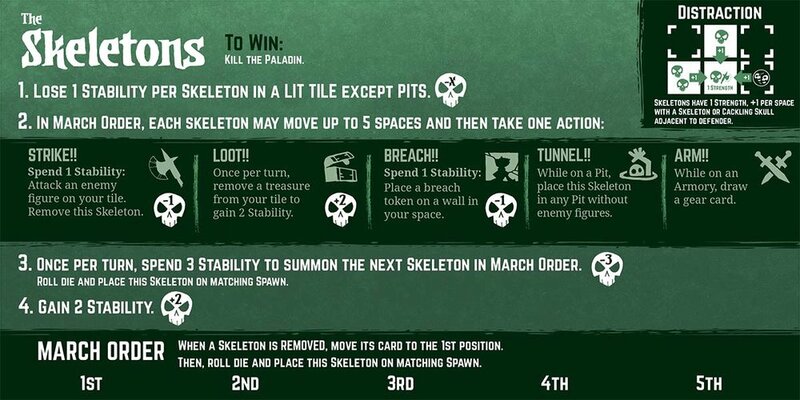 I am showing these as a sort of counter point to the skeleton player board. Where the Skeleton board required less space, we found the most intuitive change for the Spider was actually giving them 3 separate player boards. Usually you want fewer components, but by splitting the forms into 3 boards and controlling exactly what information is accessible to the player, we've found it's easier to teach and understand. Is there any advice you can pass on to those who are trying to get into the industry or find work as a professional graphic designer? Be persistent, cast a wide net, attend local events, and play to your strengths. The gaming industry is busy and hectic - don't assume that because you haven't been contacted back its a dead end. It can feel discouraging when emails and applications don't get a reply, but seriously: follow up, and follow up again. I'm not recommending you spam your prospective employer, but sometimes it takes multiple weeks and emails for companies/teams/individual people to respond. Be patient, but be persistent. For attending events I've still found Facebook to be the best tool. I'll regularly visit the Events area and search "games" "game design" or "tabletop". These can vary week-to-week but most of the time you can find something going on - local designers play testing games (Protospiel anyone?) or indie video game jams - whatever it is you find, these are other people who are trying to work in the game industry also. Sign up for their newsletters, bring business cards, and stay in contact. While I'm working I usually just put full albums on. This year has been a lot of Denzel Curry, Anderson, Paak and Kanye West - anything high energy to keep that forward momentum. For reading lately I've been loving Andrew MacLean's Headlopper comic and catching up on Hellboy as they reprint them all. For television I can't recommend 'Nirvanna the Band the Show' enough, a genre-bending buddy comedy with some of the most unique production I've ever seen. Finally, if we’d like to see more of you and your work on or offline, where can we find you? Best place to find me is on Twitter @BickNachmann and I very recently made an Instagram! I’m also currently working on an art toy in my free time and trying to post the progress, hopefully of some Gundam kits and possibly embroidered hats in the future! All images supplied by and copyright of Nick Brachmann and Leder Games. Did you enjoy this interview? Do you want to hear more about graphic design in board games? Let me know in the comments below! Finally, whilst you’re here, why not check out some of the other wonderful interviews on the site via the archive or the Top 10 Best Board Game Art of 2018 as voted for by my readers!